Communication is key when you’re working with people that come from many backgrounds. Because there are a multitude of languages being spoken at work on a daily basis, many of our members have preemptively picked up on key words in other languages. Others have become so knowledgeable as to be able to form basic to intermediate sentences in another tongue, yet there still exists the inevitable language barrier. To foster better communication at work, and to try to break down some of that wall, we started asking a few of our multi-lingual employees to volunteer as translators during their shift. 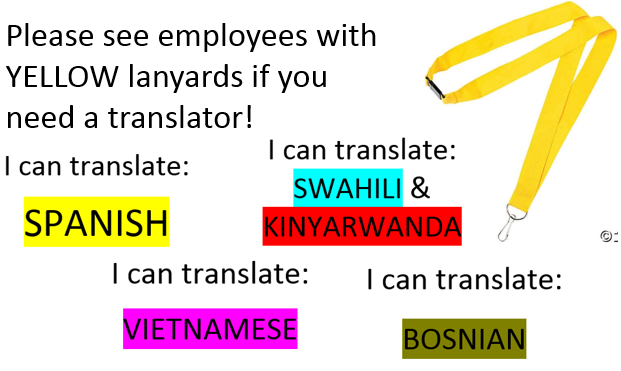 Each volunteer was issued a yellow lanyard, and a card that informed our employees of the other languages they could speak. The response from our members was overwhelming. From the implementation of this program to now, we currently have 18 official translators for the following languages – Spanish, Vietnamese, Swahili, Kinyarwanda, Bosnian, & French. Many of our volunteers stepped up to the plate and took initiative to be a part of this program. We are incredibly proud of our team and their dedication to helping us overcome this barrier. Thank you!